(05-27-2018, 01:26 AM)john Wrote: I really like the sound of Haley with the band. I hope she is featured prominently in any production that comes out of this. I do too. If the TV show is picked up, I hope she becomes a regular or semi-regular. I think though it might be pitched as "Live from Daryl's House, but with Jazz and an audience." GQ article from last year consisting of quotes about him and some of his responses. Arnold: Jeff was onstage. I go, “Is that him? What is he doing?” But he was jamming with Aerosmith. And he didn’t tell us! I would have made an announcement. Like, I’d laid three years of groundwork with Steve Tyler and Joe Perry, sucking up to them, and in two minutes, he’s onstage. Quote: Munn: Jeff plays in a band every week out in L.A.—anybody in the world can go see him. He’s lived his life in a way where he hasn’t sheltered himself, and I think a big reason why he’s so charismatic is because he’s so in touch and in tune with himself and the world and people. Allen: The next time I saw or spoke a word to him was 39 years [after Annie Hall], when he sat in to play jazz with our group at the Carlyle Hotel. Allen: He was a very good piano player. Quote: Ed Begley Jr. (‘Pittsburgh,’ 2006; neighbor, late ’70s): Jeff is the mayor of Hollywood. Guesses on the song we've heard her sing that they recorded? For some reason I'm thinking "Fever" could be a song I could see Haley performing w/ a piano player. Fever was the song Haley and Casey were going to perform as a duet on Idol, until they convinced TPTB to let them perform "Moanin", but I don't think we've ever heard Haley perform "Fever" before. 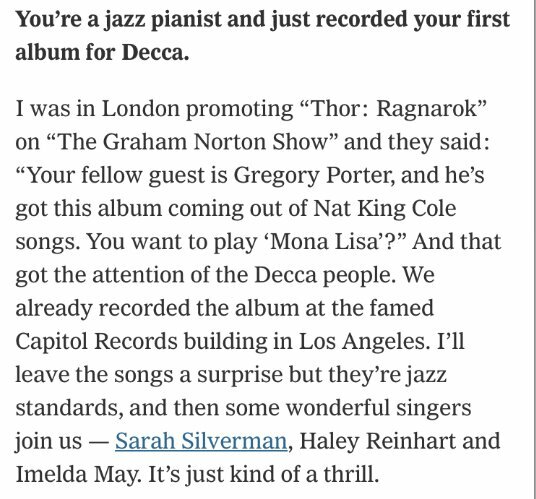 Would Haley perform "Creep" w/ Jeff Goldblum? In Jeff Goldblum's speech at his receiving of a Star on the Hollywood Walk of Fame, he thanks Alex Frank, formerly the bass player of Dave Damiani's #NoVacancyOrchestra, and I was told, did the arrangement for most of Dave's #NVO performances (including Haley's performances, like her Black Hole Sun w/ them. I had wondered why Alex appears to have scrubbed alot (all?) of his #NVO posts from his Instagram, I guess Goldblum saying Alex is part of HIS band, gives us the answer? It's quite possible Haley got the gig on Jeff's album through Alex, who Haley affectionately refers to as "Frankie"